Since 2011 we were resistant to add user accounts to Anonymous Ads because it is somehow against the user-agnostic nature of our service. However for the sake of convenience we decided to gradually rebuild our system. Few days ago we deployed a change that enables our users to get registered at Anonymous Ads. It is optional: publishers and advertisers can still use our service without registration. But if they want - they can get registered and sign in with login and password now. For users that signed in via Bitcoin signatures in the past we automatically created user accounts and linked them to ad units and campaigns with corresponding bitcoin address. We don't require email address upon registration, but if you choose to specify it - please use the one that you don't mind to publish, we don't want to hold others' secrets. Also please note that your email address can be used to recover access to your account. Before we introduced user accounts, ad units were autonomous: they had separate balances and withdrawal from a certain ad unit could happen only after its balance hits the withdrawal threshold (of 0.0001 btc by default). Thus if a publisher had 2 ad units, each with 0.00009 btc (0.00018 btc in total), there was no easy way to withdraw this money. Nothing changed in this regard unless a publisher creates ad units from his/her user account. Earnings of ad units that are linked to some user account, get accumulated on that user's balance and then withdrawn automatically when it hits the user's withdrawal threshold. Thus publishers withdrawals can happen more often (and their wallets - less fragmented). By introducing the captchas about a month ago we filtered out ~90% of our clicks as non-human. Captchas are being displayed upon ad click with a probability that depends on ad unit's performance (for ad units that generate fake clicks captchas are being displayed more often). But some publishers didn't like this solution, so we decided to make it optional for them and let the market decide whether captchas are required at all. 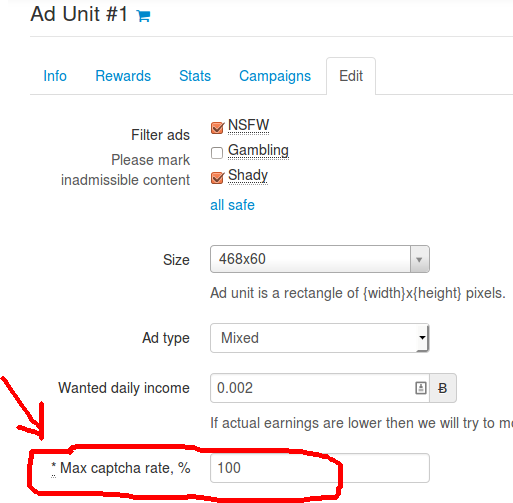 Publishers can set the Max captcha rate of their ad units, e. g. they can specify that no more than X% of clicks should be verified with Captcha. Advertisers can specify that they want at least Y% of clicks to be verified by captchas. If X < Y then ad unit doesn't fit the targeting criteria of the advertiser. So publishers are interested to set X to 100% in order to get more advertising budgets and advertisers are interested to set Y to 0% in order to get a higher conversion for their money.